With dazzling, 360-degree views over London, five-star dining and unfaltering hospitality, Shangri-La Hotel, At the Shard provides an unforgettable experience – for you and your taste buds. Sophie Voelzing tells why this travel gem should be one on your bucket list. Strolling through the streets of central London, it’s hard not to miss the gorgeous gleaming, shard-shaped tower gloriously standing out from the crowd. It’s a structural masterpiece and oozes sheer opulence. From the moment you reach the lobby on floor 35 of the building, prepare yourself for a truly luxurious, British experience, because it’s hard not to feel like royalty here. Located in the United Kingdom’s capital, The Shangri-La Hotel, At the Shard is the country’s first elevated hotel and boasts 185 guestrooms, 17 suites, and three fabulous food and beverage outlets (not forgetting a very impressive infinity pool and gym on level 52 – say ‘hello city views!’). This is a hotel well worth splashing out on. It’s a hotel that’ll take your London trip to a whole other level. It’s unique, one of a kind and an unmissable spot to visit. Even if you’re unable to stay here, I’d highly recommend booking a visit to dine here, or pop up to the Gong Bar on floor 52 where the most delightful cocktail menu imaginable resides. Now, for the most important part: the food! It’s quite a dazzling food affair here. The culinary team of 70 is led by executive chef Gareth Bowen, and they do a fantastic job. Perched on the 35th floor, you’ll find a restaurant called ‘Ting’, which despite what the name, serves modern European cuisine. Across the a la carte menu and chef’s tasting menu, some of the best British ingredients are showcased, with many of the main elements sourced locally from the neighbouring Borough Market, chef Gareth tells. With the Shangri-la brand originating from Asia, the menu also includes influences from that area of the world. There are some great fusion dishes on offer at Ting. Expect to find options including Welsh Lamb from the Rhug Estate – glazed with mirin, sake and soy sauce and served with root vegetables and Kentish apples; and Hand-Dived Scallops – cooked a la plancha with carrot, ginger and a light yuzu and grape seed olive oil. Or, like us, if you opt to go with the chef’s menu, prepare to be wowed by dishes like duck foie gras with English strawberry, griotte cherry and soft brioche, white organic chicken that comes with black garlic, peas and baby gem (this dish was my favourite – so flavoursome! ), wild seabass with nettle, razor clams and a Lapsang Souchong consommé, with a delicious dessert of strawberries and verbena to finish. The tasting menu costs £105 (Dhs507) for seven courses – and with so many interesting flavour combinations, high-quality ingredients and flawless execution, is worth every penny! For breakfast at Ting, you can head to the buffet or order à la carte. Divided into sections: ‘Healthy’, ‘A la carte’, ‘Arabic’, and ‘Full English’, there’s plenty to choose from, for all tastes. It’s a perfect place to start your day. Across the way, the lounge serves a distinctive à la carte menu of authentic Asian specialties, many from the heart of Penang. If you’re looking for more of an Asia-inspired meal, here’s where to go head. With dishes like Curry Laksa, Hainanese Chicken Rice and Nasi Goreng Kampung on the menu throughout the day, you’ll not be disappointed. Located on the ground floor, Láng is the hotel’s cake shop and artisan deli showcasing a selection of Shangri-La signature cakes alongside savouries such as soups, salads, sandwiches and seasonal hampers, with an option to eat-in or take-away. For drinks, a trip up to the city’s highest bar, G?ng, is not to be missed. Its name comes from ‘dougong’ – an ancient Chinese structural element of interlocking wooden brackets, used to support historical Chinese temples and palaces, and shows strongly through the bar’s interiors. It’s safe to say this is a pretty unrivalled setting for sundowners in London. And, with a champagne bar and cocktail bar, there’s quite a variety. If you’re looking for something a little more interactive, chef Gareth has range of options on offer for you to choose from. “If guests would like to learn more about what’s on offer locally, we have a concept called ‘at the market with chef’, which lets visitors take a trip to the market with me to pick up ingredients of their liking, before heading back to the hotel for a personalised five-course dinner – prepared using the products they picked,” explains chef Gareth. The exciting culinary experience is something that can be chosen at booking stay or during your stay. Inclusive in your night’s stay, the experience costs £475 (Dhs2,300) and also includes a classing classic Champagne Afternoon Tea and a personalised apron. With over 25 years of culinary expertise in fine dining executive chef Gareth oversees the hotel’s three unique wining and dining venues. He also leads the imaginative 24-hour in-room dining offering as well as the banqueting experience in the three river-facing function rooms on level 34 of the Shard. Chef Bowen’s passion for fine dining, seasons and good quality food saw his career guided to Michelin-starred and AA Rosette-winning restaurants and hotels such as De-Vere Dormy Hotel and his very own restaurant ‘Brookleys; in the UK’s New Forest. Or for something else a little different, Ting Restaurant is home to a swanky ‘Chef’s Market Table’. Here is where chef Gareth serves a four course menu, championing local ingredients, which are all of course in tune with the seasons. You can do this for lunch or dinner and it includes welcome drinks, canapés and wine pairing with the 4-courses. Priced at £95 (Dhs460) (Mon to Thu) and £125 (Dhs605) (Fri, Sat and Sun) per guests (minimum of six and maximum of eight guests) including wine pairing. And, for the foodies planning to visit London in October, don’t miss the ‘Festival of Gastronomy’ at the hotel, which will see a world-class chef who has earnt Michelin stars come to the property for one week to serve up a beautiful fine dining set lunch and dinner menu. “It’s the first year we’ve done it, so it’s all very exciting,” chef says. “All in all, our offering is simply unique. The fusion between oriental and local produce we have here is really special, and there’s something for everyone,” he adds. 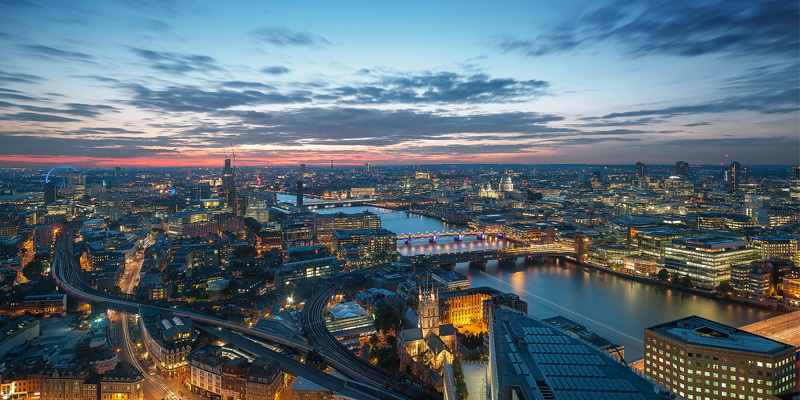 Situated in one of London’s most vibrant and historic areas, ShangriLa Hotel, At The Shard, London is close to London’s key attractions including The View from The Shard, Tate Modern, Shakespeare’s Globe, Borough Market, the Tower of London and St. Paul’s Cathedral. Just minutes from the hotel, the Southbank is home to one of the most visited modern art galleries in the world, Tate Modern. Set in the former Bankside Power Station, Tate Modern is Britain’s national gallery of international modern and contemporary art. Admission to the gallery is free except for special exhibitions. Borough Market, one of London’s oldest and largest food markets is just moments away. The bustling market serves as an integral source of the most exceptional British and international produce for the city’s restaurateurs as well as locals and tourists looking for delectable delights. It’s an absolutely amazing place to see – especially coming from Dubai where markets like this just simply don’t exist. Also close by is the Shakespeare’s Globe Theatre, a spectacular reconstruction based on academic approximations of the original 1599 and 1614 structures, allows for Shakespeare’s works to be viewed 400 years on. And, not forgetting The Tower of London, which has served a variety of purposes in the more than 900 years since it was built by William the Conqueror. Constructed initially as a fortified castle it has since been used as an armoury, a prison, a zoo and now most notably as Her Majesty’s Royal Palace and Fortress. Among other areas, you will have access to see the Crown Jewels, The White Tower and the Line of Kings. it won’t disappoint. Just five minutes by tube from the hotel, the Royal Exchange, is home to some quintessentially British merchants and some of the world’s leading boutique stores, including Hermès, Gucci and Tiffany & Co. Alternatively Bond Street is just 10 minutes away by tube providing direct access to Bond Street and Oxford Street shopping areas.